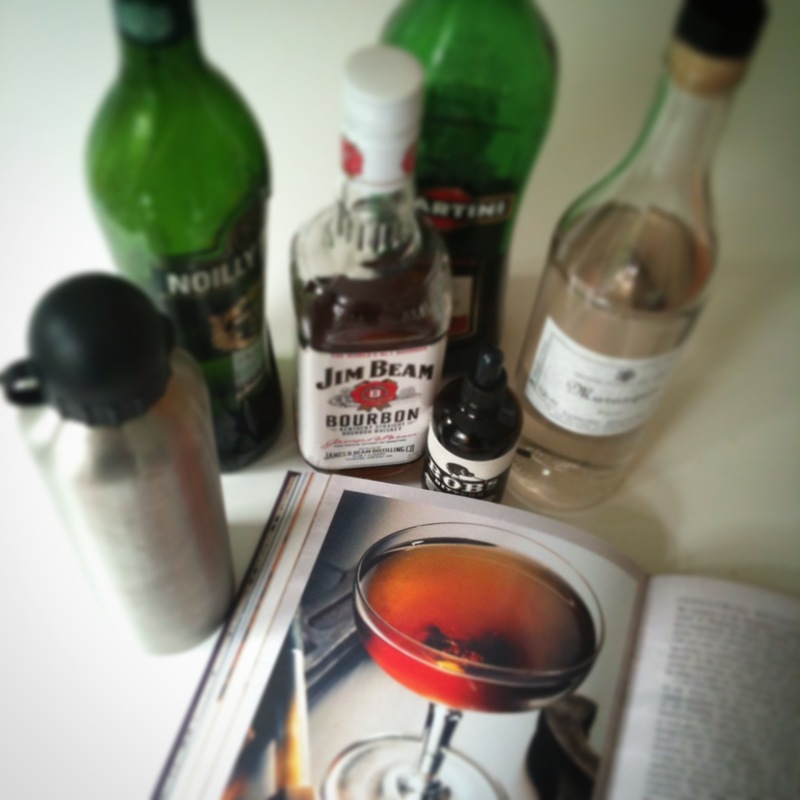 The section in Tristan Stephenson’s Curious Bartender about ageing cocktails was very interesting to read. Most cocktail ingredients – spirits, vermouths, bitters and so forth – have been through individual ageing processes before being bottled, creating their unique flavour that adds to each drink they are used in. Stephenson suggests another level of ageing, mixing a cocktail and then allowing the blended drink to rest for a further period, creates a subtly different drink to the one mixed and served immediately, giving examples of both his own drinks and those of other bartenders he has sampled. He notes the differences between the various ageing devices, from wooden barrels to bottles & flasks, retaining his greatest enthusiasm for simple stainless steel flasks. All of this went into the flask, given a good shake and labelled with the starting date. I aim to be trying this out with some friends at a cocktail evening in September. I will keep taking a quick sniff from the flask from time to time to see if I can detect any changes. Last night, I returned to a batch of rye-based Manhattans I made around Christmas 2016, and which had been maturing in a flask in my drinks ‘fridge ever since. Chilled & ready mixed, I just needed to measure out 3ozs into a cold glass, and add a garnish of lemon zest. Somehow, resting quietly at a few degrees above zero for around a year had really changed & improved the flavours of the drink; it was an incredibly smooth Manhattan, rich and spicy & with a distinctive, but not overpowering, bitter note. This might see like an overly-elaborate method of cocktail making, but it really does seem to add a dimension to the drink I hadn’t expected. I really don’t know what is going on with this approach, but something good is happening in that flask. Worth experimenting with, I believe – if you have the time, and the patience.